Tracking is a sport in which a dog follows the scent of a person who has earlier walked through the area. The dog must find and indicate various articles that the person has dropped. 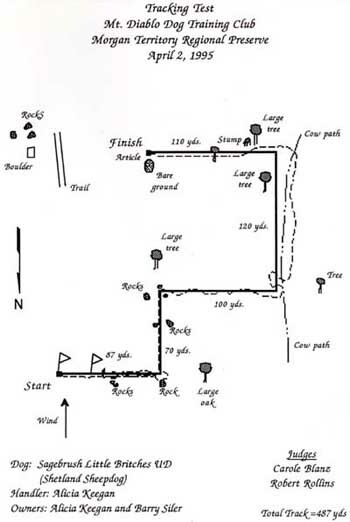 The track is laid out in patterns of straight lines and corners, not because the dog would have trouble following a meandering walker, but because the judges must be certain where the track is located. The track is thirty minutes to two hours old for the Tracking Dog (TD) test, and three to five hours old for the Tracking Dog Excellent (TDX) and Variable Surface Tracking (VST) Tests. When most people think of tracking, they think of bloodhounds or German shepherds, not of Shelties. The community of tracking enthusiasts is a small one, and that of Sheltie tracking enthusiasts is tiny. 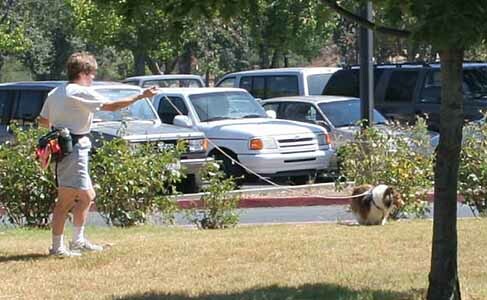 But Shelties are just as capable of tracking as any other breed, and do very well in tracking tests. The first dog I trained to track was Ch. Sea Isle Clancey of Sagebrush, UD. Clancey was a great tracker, but I was mostly training by myself. No one was available to teach me about reading and handling a tracking dog. As a result of my ignorance, she never earned her TD. 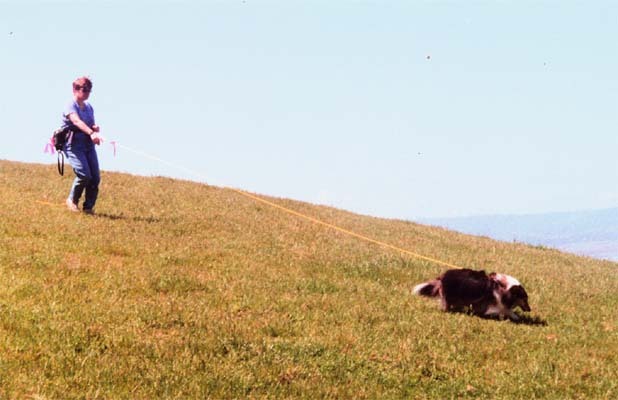 But she was the Sheltie whose photos illustrate tracking for the book, Sheltie Talk, with a much younger me handling her. We took the pictures in Laramie, Wyoming, in about 1975, at the request of author, Barbara Rieseberg. Complete set of Clancey's tracking photos. This chart of Britches' successful TD track shows the tracklayer's route as a solid line and the dog's path as a dotted line. The first of my Shelties to earn a tracking title was Sagebrush Little Britches, UD TDX. 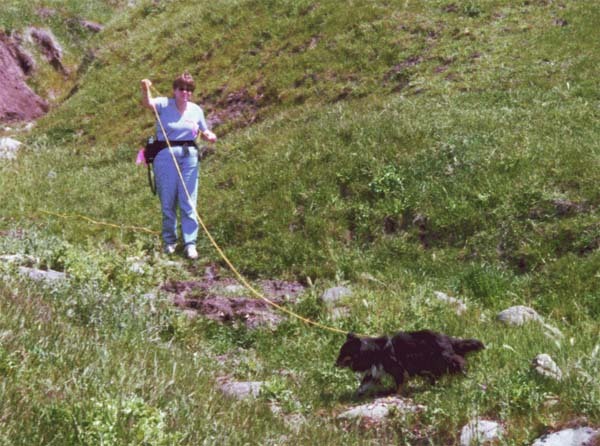 Britches was an indifferent obedience dog, but an excellent tracker. We started tracking when she was nine years old, and she earned her TD at age eleven. She then went on to her TDX at age 12, on a very difficult track that took her an hour to complete. Britches was a distractable dog, but very reliable when on the scent. She once tracked right under the nose of a curious horse, without giving any indication that she realized the horse was there. She tended to follow the edge of the scent, a habit called "fringing", which makes it harder to interpret the dog's actions, but she never missed an article on that account. Britches is pictured above the day she earned her TDX, only the 28th Sheltie to earn that title. 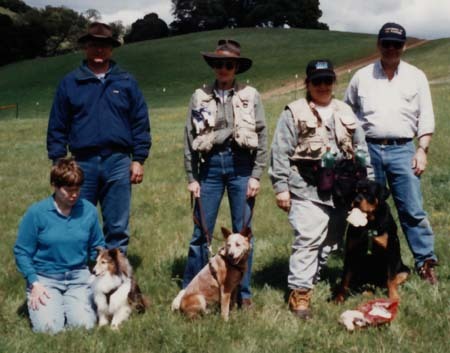 Raven was my third tracking dog. She was a challenge to train, because at first she was afraid of the glove! We finally got her to follow a track with the aid of hard boiled egg, which is very messy to handle. She proved to be an extremely reliable tracker, although I never knew until I got to the start flag whether she would track that day or not. Her successful TDX track was memorable because of the small rattlesnake basking in the sun on the downed tree trunk that was one of her obstacles. We had to detour around the snake, with me carrying her. Here, she searches for the scent in a muddy creek bed. CT Sagebrush Molly Brown, UD HS AX OAJ HTD-IIs HRD-IIIs VCD2 was the first Sheltie in the country to earn the AKC Champion Tracker title. She started tracking at the age of eight, earned her TD at nine and her VST title at age ten. Six months later, she passed her TDX test to become the first Champion Tracker Sheltie. Kerry was a slow starter in tracking, in part because of her distractability. Like Molly, she tended to overshoot corners, but learned to work her way back. The dogs who were started tracking after Molly all learned variable surface tracking as puppies. Thus they learn from the very beginning that a track can be followed on hard surfaces. 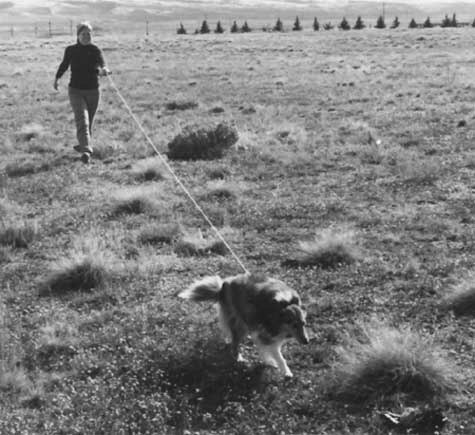 Ceili, who earned her TD in February 2007, worked out a transition from mowed lawn to asphalt pavement at a 2005 advanced tracking workshop. Ah, Dustin! Tracking isn't his first love–he much prefers agility and sheep herding. Still he has a good nose, and is a very capable tracking dog. He failed his first TD test because he decided, only 30 or 40 yards from the end of the track, that there were far more interesting things to do than wade through the tall grass following a scent. He passed on a windy rainy day on his second try. When we started advanced tracking, he made it quite clear that non-vegetated surfaces like asphalt and concrete were much preferable to tall weedy grass in his face. So, like Molly, he earned his VST title without having first earned a TDX. He passed in November 2015 at the University of New Mexico in Albuquerque, where the non-vegetated surfaces constituted a large majority of his track. He is the first Champion Sheltie to earn a VST title. It then took him six tries to earn his TDX and Champion Tracker titles. He passed on a cloudy day at Eagle Island State Park in the Boise, ID area to become the seventh Sheltie and first breed champion Sheltie to earn the CT title. Dustin and I are pictured with judges and tracklayer the day he earned his TDX on November 20, 2016. He was very proud of himself, and shamelessly begged for his share of my pulled pork sandwich. The Shelties Who Track Alicia's lists of Shelties with tracking titles.